The ocean is easy to take for granted一every day the tides roll in and out like clockwork, salmon return each season to their natal streams, and the ocean provides essential resources to sustain life around the globe. However, changes are happening at an unprecedented rate and the magnitude of the consequences of these changes is largely unknown. Oceans are not only threatened globally by poor management and overfishing; global and local impacts of climate change are altering the physical oceanic conditions and impacting marine life at its most fundamental levels. Our marine natural resources can no longer be taken for granted. Washington State is no exception! Ocean acidification, ocean warming, and hypoxia are fundamentally changing the chemistry of and ecosystems in our waters. The Blue Ribbon Panel on Ocean Acidification and the recent Addendum to the Panel report were created to provide important scientific context and a shared, proactive state strategy for actions to address these changes. As ocean conditions change, natural resource management and policy development must respond accordingly. 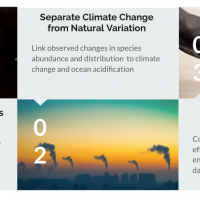 Thus, in order to support science-based policies and management actions, we decided to tackle a research question that started at the source – the questions and concerns of natural resource managers – to find out how changing ocean conditions are impacting resource management and what information is needed to best respond to these issues. A bit about us: Why this matters so much! I grew up in a small coastal fishing town in Alaska, where commercial, recreational, or subsistence fishing is a way of life. Harvesting salmon, shellfish, and groundfish provides income for families, sustenance for the long winters, and creates a sense of culture and belonging for Alaskans and many other coastal communities and indigenous cultures. This way of life is being threatened by climate change. Now, returns and fishing quotas are unreliable when they once were a guarantee, and the reasons behind dramatic declines or crashes in some salmon, crab, and fish populations are greatly unknown. But what is known is that the ocean is changing –by how much, exactly where, and how it will impact populations in the future is not. How will managers adjust to the overwhelming number of unknowns? Will we be able to predict run failures, population crashes, and shifts in species’ ranges? How will livelihoods, economies, and this historical way of life be affected? 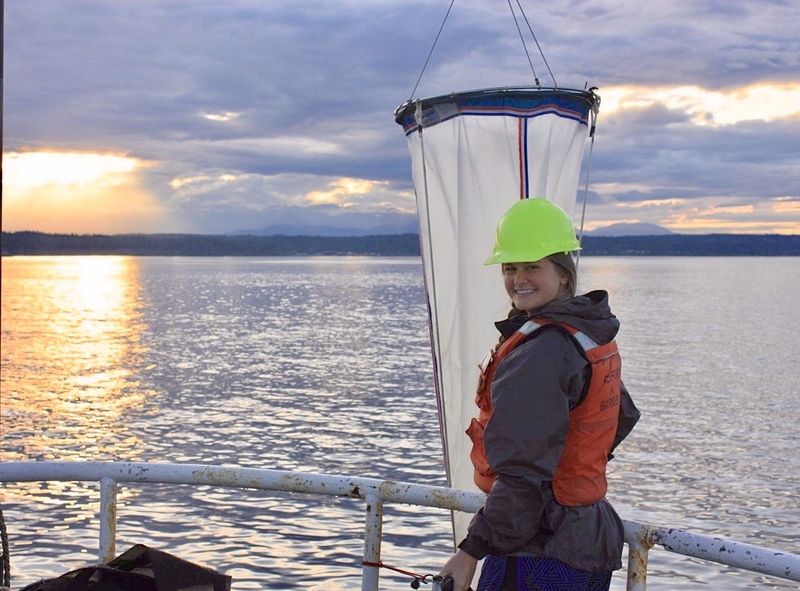 Katie Keil sampling zooplankton on a research cruise in Puget Sound. For the past two years, I have been studying the ways in which ocean acidification is affecting local zooplankton communities and who the biggest “losers” are in the face of climate change. I’ve learned the ways in which zooplankton abundance affects the health of the ecosystem and the endless complexities of understanding, mitigating, and adapting to ocean acidification. I was surprised (and excited) to find that ocean acidification ranked as the highest concern among our project’s survey participants. The general public has been aware of sea level rise, ocean warming, and other threats for some time, but ocean acidification is a relatively new topic. Did it rank the highest because it has been getting so much publicity these past few years? Or are people noticing the impacts, and are concerned about how the resources they manage will be impacted in the future? We were fortunate to have this project fall into our laps in a perfect storm of factors. This project was presented as a group collaboration project with individuals from the Office of the Governor, the Washington Department of Natural Resources (WDNR), and the two of us representing the University of Washington Program on Climate Change and our home department of the School of Marine and Environmental Affairs. We jumped on this opportunity to collaborate with Washington State government officials and were excited to put our knowledge of marine and environmental policy and science communication gained from our graduate studies, our personal knowledge and experience, and individual strengths to use on a project that was so timely. Shortly after the project began, we lost a group member (who was a brainchild of the project), which presented new hurdles for those of us remaining; however, we are very grateful to have gained a bright mind and electric personality from the Washington Department of Fish and Wildlife (WDFW). The four of us charged on. Our goal was, broadly stated, to find out how climate change is impacting natural resource management in Washington State and what information is lacking but necessary to help managers best respond to current and projected impacts of changing ocean conditions on these resources. To dig into these questions, we decided to gather first-hand information through numerous interviews of State government and Tribal natural resource managers throughout the state, specifically asking them to elaborate on their current uses of data to make management decisions, and to discuss data needs, gaps, and barriers in effectively managing resources in a changing climate. We then distilled and summarized these data collected from in-person interviews and pulled out common themes in order to provide guidance on the creation of a survey. The survey was intended to gather similar data focused on the same questions regarding data uses, gaps, barriers and priority needs, but the goal was to distribute the survey in an online format to a much broader group of natural resource managers, scientists, and end users. After spending months brainstorming, editing, tweaking, changing, rewriting, editing (again), rewording, evaluating, field testing, and (yet again) editing the survey questions, we settled on the best 13 questions. We presented our project and survey to the Washington Marine Resources Advisory Council (MRAC) and asked MRAC members to distribute the survey to their constituents. After months of hard work, we were finally able to exhale and watch survey responses trickle in. We have analyzed this survey data in many different ways in order to best summarize the top concerns related to resource management in changing ocean conditions and research priorities of natural resource managers. Another (somewhat informal) goal of this project was to not only generate data on specific concerns and research priorities but to delve into issues relating to communication – or lack thereof – and to start a larger conversation about the need for collaboration on the previously mentioned issues within and among Federal, State, Tribal, and non-governmental entities throughout Washington State as well as across state lines on the West Coast. In our survey, we asked for suggestions on how collaboration and data sharing could be improved, and we hope we will be able to use their recommendations to propose action that will improve linkages within and among organizations and ultimately solve these problems more quickly and efficiently. Katie and Nyssa’s top three recommendations for improving natural resource management in Washington State in a changing climate. situ studies to identify survival thresholds of vital organisms, such as plankton and commercially important fish. Barriers, data obstacles, spatial scale preferences, and modeling needs were also identified, and will be used to inform future science and monitoring efforts. In order to improve the lacking coordination and collaboration within and among entities, we recommend sharing monitoring and research efforts by compiling them into an accessible database. Overall, it became abundantly clear through survey responses and interviews (such as the quote below) that natural resource managers are struggling to effectively manage around the unknown. This project took on a life of its own. What seemed like a straightforward project and path to achieve the project goals and objective turned out to be a winding road with many detours and stops along the way. Needless to say, we made it to the destination and surpassed all our expectations. That being said, we were not naive going in. We knew that creating interview questions and the process of taking an interview recording and ending up with statistical outputs is not trivial. We also knew that designing a survey is a lot of work – even creating seemingly straightforward questions can be complicated. One of us would draft a question and each member of the group would interpret it in a different way. It took countless drafts and revisions before we came up with a draft that we were willing to present to anyone for feedback. Although time consuming and challenging, our hard work is reflected in our professional growth – we have learned the art of crafting interview questions, fine-tuned our survey design skills, and become proficient in new softwares, such as ATLAS.ti. Since this project has gained so much attention throughout the state, we intend to disseminate our findings in as many ways as possible. Collectively, we have given presentations to diverse audiences, are currently working to finalize a summary document that will be posted online, and have recently elected to publish our results in a peer reviewed journal (wish us luck). 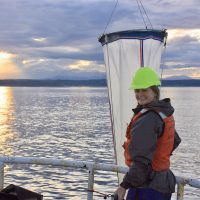 We hope this research is just the beginning of a much larger project that can be used to gather more detailed data and allow for collaboration among other West Coast states so a bigger picture can emerge of the concerns and research needs of natural resource managers along the Pacific coast. Although our project focused solely on adaptation strategies, we were constantly reminded by interview quotes such as the following that as we move forward in an unpredictable climate, prevention is key. We must continue to fight for climate change regulation because without mitigation, the need for adaptation will only grow greater. Nyssa Baechler earned her Master of Marine Affairs (M.M.A) from the School of Marine and Environmental Affairs in June 2018. Her research focused on forecasting methods for adult returns of sockeye salmon in the Chignik River, Alaska. She completed this capstone project as part of the Graduate Certificate on Climate Science. Katie Keil is a Masters Candidate in the School of Marine and Environmental Affairs. Her research focuses on the impacts of ocean acidification on zooplankton. She also completed this project as part of the Graduate Certificate on Climate Science.